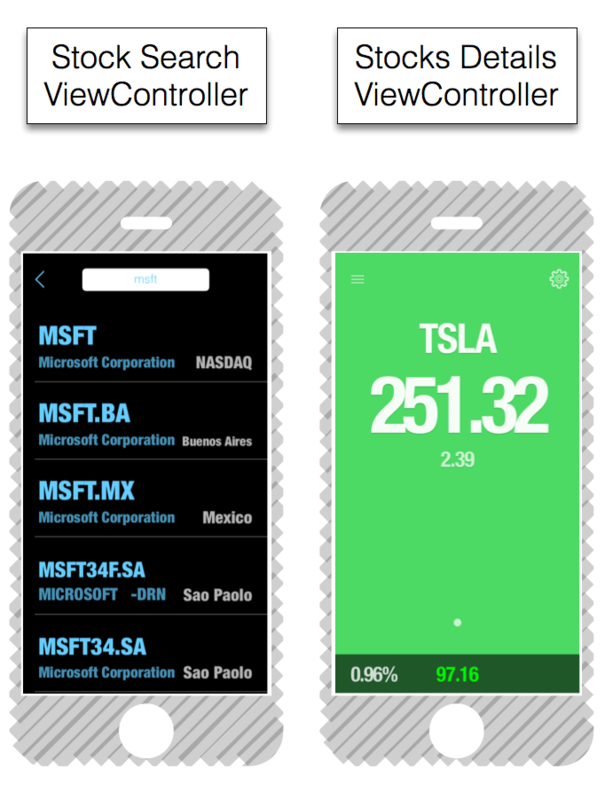 In the first chapter of this series, we designed a model, created a mockup, and started a swift project, ending up with the first viewController -the tableView- with some hardcoded stocks and values. If you remember our app model, we have a Singleton class which is the responsible of getting the stock data from the Yahoo Finance API. 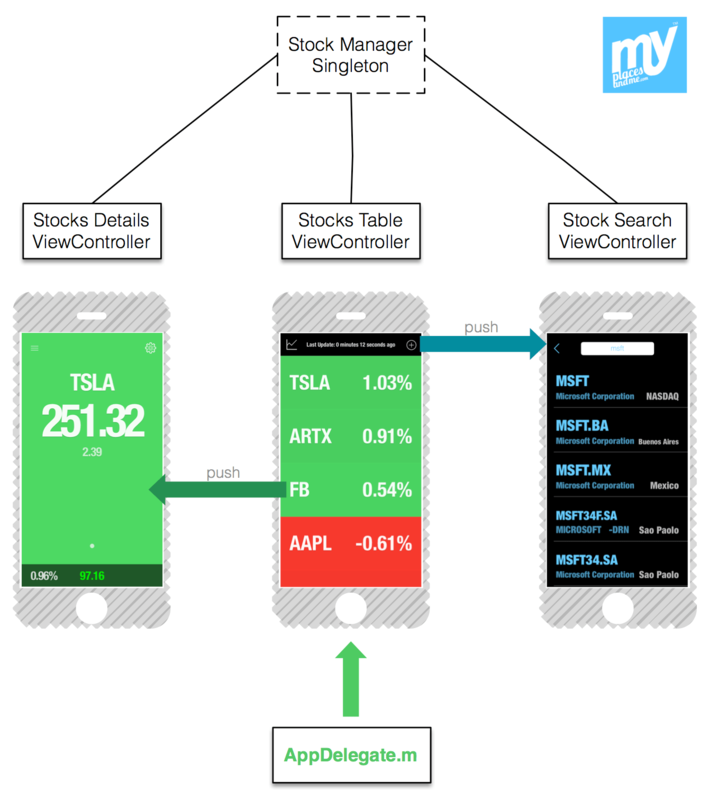 This singleton (now named “StockManagerSingleton“) will communicate via web services with Yahoo API in order to provide our ViewControllers with the proper real time data to show. There are other ways to implement this pattern, you can see more here. Now build and launch the app. When you touch/click on a cell, the message “TEST OK :)” should appear in the output. That means that our Singleton is working. Note that in Swift, we don’t have to import manually other Swift classes within the same project. We know that our Singleton class is working. Now it is time to start implementing the web services methods in order to gather stock data from Yahoo F-API. What kind of method would we need? We have a table with some stock symbols on our StocksTableViewController. We need to now the value of those symbols. So we need a method in our Singleton which, receiving some symbols, provide us the stock value of each one. 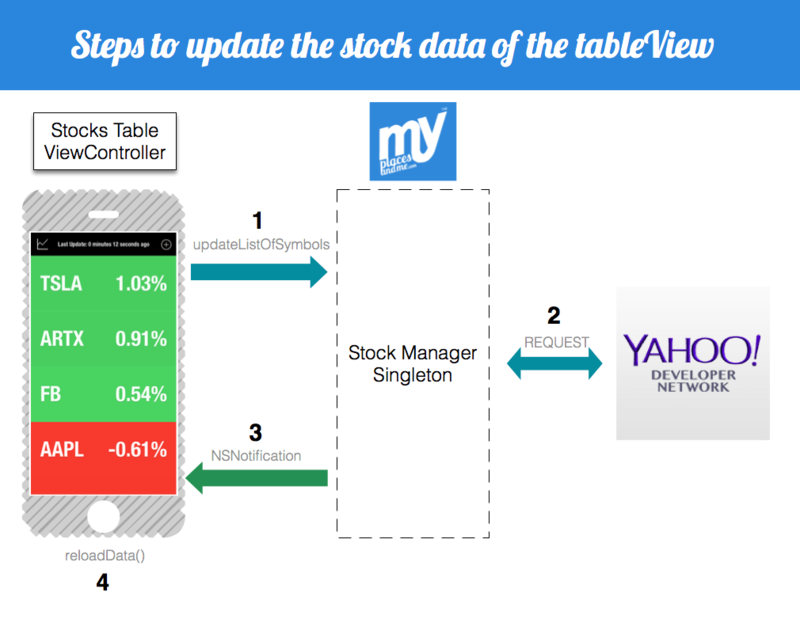 The singleton method, send a request to Yahoo Finance API and get a response. Our tableView was listening to the NSNotification, so it receives the fresh data and updates itself. stringQuotes = stringQuotes + ")"
var urlString:String = ("http://query.yahooapis.com/v1/public/yql?q=select * from yahoo.finance.quotes where symbol IN "+stringQuotes+"&format=json&env=http://datatables.org/alltables.env").stringByAddingPercentEscapesUsingEncoding(NSUTF8StringEncoding)! //6: DONT FORGET to LAUNCH the NSURLSessionDataTask!!!!!! //2: With the array of stock tuples, we are building a piece of the request. This one: (“AAPL”,”GOOG”,”FB”). And then, we complete the request of the comment 1. //3: We define what to do when Yahoo answers our request inside a completionBlock or closure. First of all, we check for errors. //4: If there are no errors, we parse the answer into a JSON NSDictionary. We have to check again for errors in the parse process. //5: No error during the parsing? Then we can extract the data we want from the NSDictionary, and send a NSNotification with the proper userInfo. We need to register the StocksTableViewController as a listener of this notification, in order to display the received data into the tableView. But this is done in the viewController itself later. NOTE: We send the notification in the main thread, because we are going to update the UI! //6: Without this line, no request is sent, so you should never forget it! It seems that we have a Singleton Class, with a method that provide us with yahoo stocks information. Sounds good. Lets check how it works! 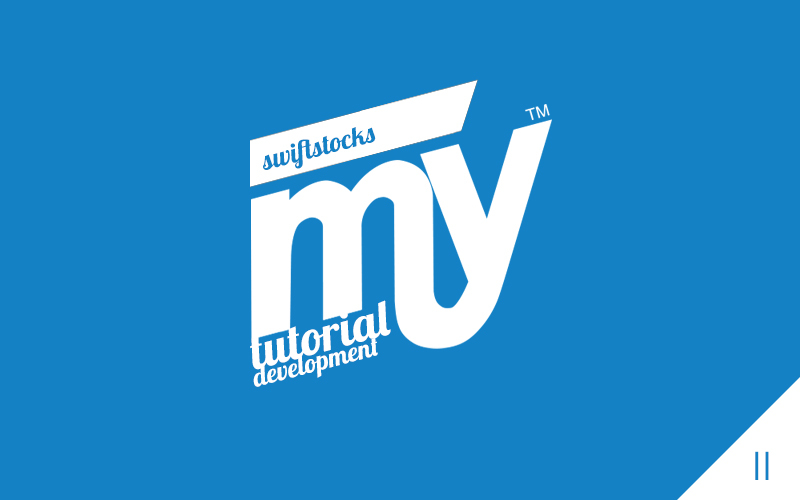 Go to StocksTableViewController.swift. We are going to do some changes here too. We need to call the singleton for the data, listen to the NSNotification, and process and display the new information. 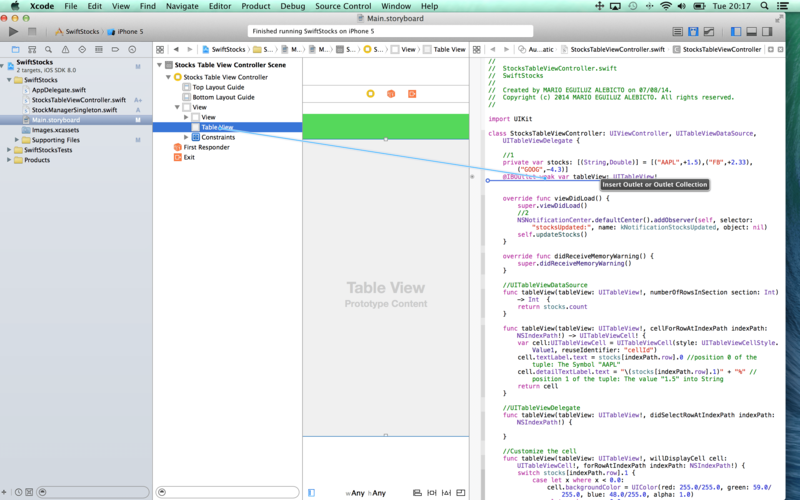 We are going to reload the tableView, however we have no reference to it in our viewController. Lets make an outlet! 1. Open the storyboard, and show the Assistan Editor (View->Assistant Editor->Show). //1 private var stocks: [(String,Double)] = [("AAPL",+1.5),("FB",+2.33),("GOOG",-4.3)] @IBOutlet weak var tableView: UITableView! The first two lines are responsible of calling the Singleton class and passing to the method updateListOfSymbols our array of symbols. The final part of the method, is a code block to repeat this method every 15 seconds. 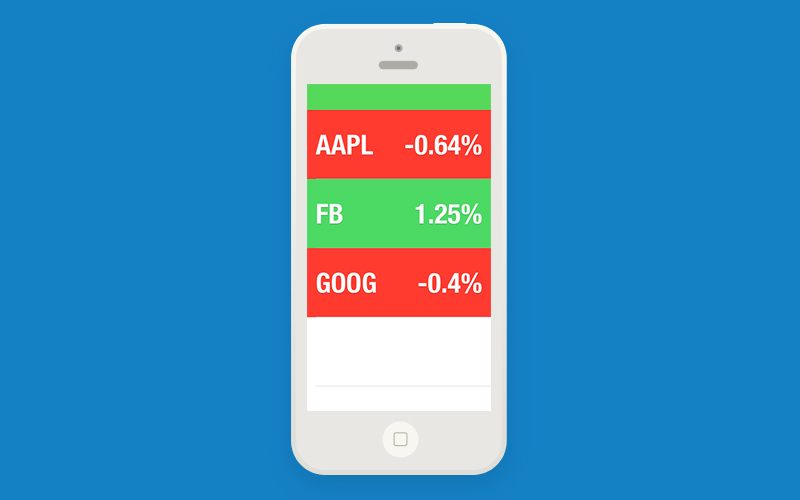 We want our app to automatically update the table of stocks every 15 seconds (if you put a lower time of seconds, yahoo API is going to send you error responses). We are DONE! Build and launch! Any doubts, problems our improvements…I read you in the comments. Here you have the Github project and the download link. Hope you liked this tutorial. Want more? We will cover soon how to implement the other 2 viewControllers: The search screen and the details screen. Stay tuned! If you have compile errors with the code of the post, download the github project at the end to see the changes. As I learn Swift, and had to migrate my singleton database class to Swift, this was the first clear, working example I found of how to do this Swift-style. Mahalo from South Kohala, Hawai’i. It is great when it helps someone! Thanks for your comment! I have found that one of the major challenges in a programming language new to you is learning the correct patterns. The grammar, so to speak. If your grammar is incorrect, the code will not work. Often, the Apple documentation, while technically correct, fails to give you an example that shows the pattern in a working example that is not obscured by needless complexity. Then you see and understand. Get it working, and then move on. Did you ever release part 3 for this tutorial? Mario, thank you so much for this example. As Mel said, it is great to learn some of the correct patterns to use rather than hack code together and hope for the best. Thanks again for your time and putting this together for the community. Hi, will you be releasing part 3? Thanks! Hi Preston!! I will try to take some time to write about the Search Controller soon! Sorry for the delay, too much things going on! Yay, I’ve been waiting to see how this would work.